Allowing mistakes is defined as ‘permitting a person to do things incorrectly or make errors of judgment without consequences.’ Research shows that people in a High Performing Culture learn more effectively from their mistakes than from their successes and that knowledge from mistakes depreciates more slowly than knowledge from success. However, in general, people have difficulty owning up to a mistake and this is all the more true the higher up the organizational ladder. It seems that especially managers are afraid to set the right example by openly admitting they did something wrong or something went awry. Managers in a High Performing Culture therefore actively promote undertaking experiments and learning from mistakes. They permit employees to take risks, are willing to take risks themselves, and convey that mistakes are an opportunity to learn. Managers in a High Performing Culture have a tolerance for failure and setbacks, they don’t play the blame game, the focus is on remedying and improving. People do not need to cover up their mistakes but can openly discuss these and subsequently learn from them. Messengers of bad news are not punished for bringing the news, they are actually rewarded for their courage, while people who hide their mistakes are reprimanded. In a High Performing Culture nobody cares about why a mistake was made but about how it is going to be fixed and what can be learned from it. There is however in a High Performing Culture one type of mistake which is never allowed: the same! People working in a High Performing Culture also know that if they never make a mistake, they are probably playing it too safe and are therefore not innovative enough. Our chief executive officer says it all the time: do your thing and if this thing eventually has to be changed or adjusted we will let you know, but start doing it anyway. People always have a bit of fear taking charge in this manner, they always want to do the right thing. Clearly some mistakes are harmful. In a highly regulated industry we have to draw the lines. We encourage being accountable, from making decisions when they’re needed to calling out incongruent behavior when you see it. At the end of the day, it’s about being engaged. Create an understanding in the organization of the kinds of mistakes and failures that can be expected to occur in a given work context and why openness about the mistakes is important to be able to fix them and learn from them. Embrace messengers of mistakes openly, so that people who come forward with mistakes are rewarded rather than punished. Be open about the mistakes that you have made and that you cannot fix alone, this will encourage others to do the same. An interesting ‘by-product’ of owning up to your mistakes is that it actually increases trust of your employees in you. Invite participation by asking for observations and ideas and creating opportunities for people to detect and analyze mistakes and failures and promote intelligent experiments. Set boundaries to make clear what is and what isn’t acceptable, and hold people accountable. If someone is punished, tell those directly and indirectly affected what happened and why it warranted punishment. Introduce ‘the blunder of the week’ on the agenda of meetings. All persons present have to state their biggest goof-up of the past week – which shouldn’t be something minor like “I forgot to return your call”- and which should be accompanied with the things the person learned because of the mistake. The first person to always start owning up should be you, so that a High Performing Culture of safety is created for everybody to speak freely. Is the culture within your organization a High Performing Culture? Our HPO-diagnosis will give you more insight! 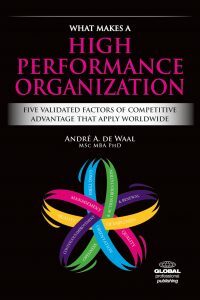 For more information about creating a High Performing Culture, the HPO Framework, HPO Diagnosis, our lecturers, HPO Experts, workshops and Master Classes, please contact us (vink@hpocenter.com or T. +31 (0) 35 – 603 70 07). We give people so much responsibility early on in their career that mistakes are bound to be made, you just expect them so that is not such a big deal. Making the same mistake twice, that is really not done because then you show that you haven’t learned from the first time around. Tolerance for the same mistakes is just plain low here. We are the world’s greatest bank, not the world’s most perfect bank. Mistakes are going to be made, they just are. But it is a matter of how empowered one is: Is someone allowed to fix a problem at all cost, especially when it happened several times, and you’re going to lose customers if you can’t fix it at the end of the day? The important thing is that we talk about the opportunity around a mistake or a customer issue. There is more opportunity in issues than in the day-to-day transactions and being nice and giving service. If you are empowered to turn a bad situation into a good one, our frontline people will say: “I am going to see what I can do here” and they go to the ends of the earth. They are not always going to be successful with everyone, certainly, but they convey to customers that they try as hard as possible. We learned a lot from the Ritz-Carlton. A lot of their teachings say that it is not only about making the stay at their hotel really great and continuously surprising and delighting their guests, but about handling a complaint in such a way that guests are going to tell 20 friends: “Go over there and let them make a mistake because what they do to fix it is great. A High Performing Culture doesn’t mean you don’t make mistakes! If we make one, we will genuinely own up to it and that is much appreciated by the customer. If something goes wrong and you are able to be open about it and fix it quickly and afterwards make sure you solve the root cause of the mistake, you will get many compliments from your customer. Perhaps the most difficult display of behavior to overcome in an organization and in the relation with partners and customers is the blame culture that kicks in the minute something goes wrong. We, from our very inception, have addressed the ‘finger pointing’ issue by taking 100 percent responsibility for the availability of mission critical applications at the customer. Our company culture and natural attitude is to first solve an issue with all means possible and only afterwards, through fact based analysis, find the root cause and plan and execute fixing the problem structurally. Adopting this mindset frees up time and energy – which otherwise would be devoted to figuring out who is at fault or who is to blame – to productively diagnosing and solving problems. Consequently, a High Performing Culture that avoids finger pointing also prevents partners from defensively withholding information from each other. Information that may be important to their mutual and customers’ success but which is not shared for fear that it might be used as evidence of incompetence or poor performance. Based on our collaborative attitude, behavior and High Performing Culture we are capable of building high-trust relationships with all parties involved.